Discover one of the most famous beaches in the world and marvel at the spectacular Benagil Caves, on a jeep and boat tour combined! The Portimão Jeep Safari Full Day tour is a voyage to discover the deepest Algarve through off-road tracks, refreshing streams and old villages where time has stopped. The Portimão Jeep Safari half day is a voyage to discover the deep Algarve. The Portimão Superday Safari is an exciting Jeep trip with amazing landscapes, typical villages, fauna and flora of the Algarve. 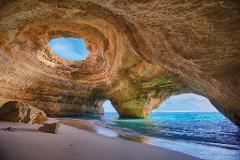 Extremo Ambiente will take you on a shore trip to visit Benagil Caves.